Kabul, Afghanistan – Afghan President Hamid Karzai was forcibly removed from office early Wednesday morning in an apparent coup orchestrated by military officers. 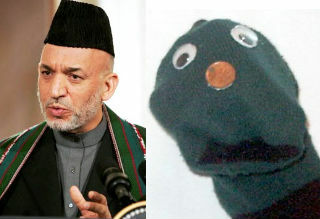 Karzai is said to have escaped, and has reportedly taken refuge in the British embassy in Kabul. Sammy, a puppet made of a large green and black sock with glued-on googly eyes, was introduced in a statement to the press as the new president. The statement was written in English, adding to speculation that the United States had a hand in the coup. The U.S. recently expressed its unhappiness with corruption and voter fraud linked to Mr. Karzai during the recent presidential election. But Secretary of State Hillary Rodham Clinton said she is certain no one in the U.S. government had anything to do with Karzai’s ouster. Mrs. Clinton said the State Department’s main objective at this time is to limit violence during the fragile transition period, and to ensure the safety of President Karzai. Many Afghans celebrated Mr. Karzai’s departure, saying they had lost faith in his ability to lead the country even before the tainted election. One Afghan man living near Kabul, who preferred to remain nameless for fear of reprisals by Karzai loyalists, said it is only fitting that Mr. Karzai, who many saw as a puppet of the United States, was replaced by a puppet.